Cysts are noncancerous, closed pockets of tissue that can be filled with fluid, pus, or other material. 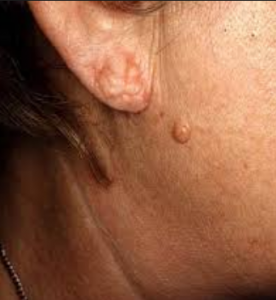 Cysts are common on the skin and can appear anywhere. They feel like large peas under the surface of the skin. Cysts can develop as a result of infection, clogging of sebaceous glands, or around foreign bodies, such as earrings. whether the cyst is infected. Cysts can range in size from smaller than a pea to a few centimetres across. Skin cysts don’t usually hurt, but can become tender, sore and red if they become infected. Foul-smelling pus coming out of the cyst is another sign of infection. They affect young and middle-aged adults, and are particularly common in people with acne. They don’t usually run in families. Skin cysts aren’t contagious. However, the cells sometimes move deeper into skin and multiply, forming a sac. They secrete keratin into the middle of the sac, which forms a thick, yellow paste. This can ooze out of the cyst if it’s burst. Anyone can develop a skin cyst, but more likely to have in puberty, with a history of acne, or injured the skin – for example, if have damaged a hair follicle. In some cases, cysts go away on their own. Putting a warm compress on a cyst can speed up the healing process by helping it drain. Injection: This treatment involves injecting the cyst with a steroid (cortisone) that reduces swelling and inflammation. Incision and drainage: With this method, a small cut in the cyst and gently squeezes out the contents. This is a fairly quick and easy method, but cysts may recur after this treatment. Minor surgery: Remove the entire cyst by minor surgery. Minor surgery is safe and effective and usually prevents cysts from recurring. Infection: Incase of infection and after surgery, may need an antibiotic coverage. Laser therapy is one of the option. 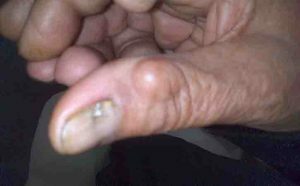 Is in an unusual location, such as a finger and toe.